This is a casting for one of our biggest customers. We have 3 vibratory cells. At NIDC, we have very low turnover, resulting in quality products. Click here to read about Small Business Person of the Year. 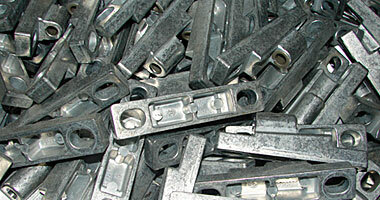 Northern Iowa Die Casting, Inc.
Click here to learn more about our commitment to American jobs. Please send us an Request for a Quote or give us a call. 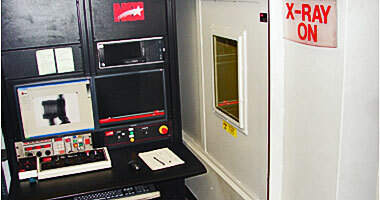 NIDC, Inc. uses self-contained casting cells with machines ranging in size from 150 ton hot chamber to 800 ton cold chamber. Each cell boasts individual breakdown/holding furnace, automatic and manual die spray, water or air quench and hydraulic trim press. 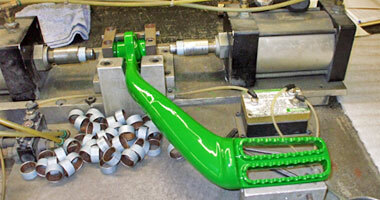 In addition, the cold chamber casting cells utilize auto-ladle metal delivery. 360, 380, 390, 413, Zamak 3 & 7. ZA8, ZA12, ZA27. ACuZinc 5 & 10. At NIDC we focus everything we do on maximum flexibility. We specialize in medium and low volume projects (approximately 10k - 250k+ EAU). Utilizing independently operated casting cells, we are able to cast a variety of alloys simultaneously. This allows NIDC to determine and use the perfect alloy for your application. Follow us on Twitter or become our Facebook friend. You can also check us out on LinkedIn, and maybe learn a little more about our team. Copyright 2012. 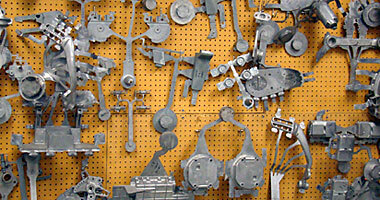 Northern Iowa Die Casting, Inc. All Rights Reserved.